"Up-scaling and conversion is the most important aspect of any 4k UHD TV for 2015/2016 due to the dearth of 4k content." The difference between the X850C and the X830C is the lack of the Triluminous Display in the X830C. Compared to the X900C and 950C top of the line Sony, the notable picture quality attributes missing in the X830C and the X850C are the Extended Dynamic Range – a feature which gives colors extreme accuracy and bright colors. We feel the X850C comes pretty close to the X900C in picture quality this year. Blacks are inky and excellent as is black uniformity. Color rendition is realistic and not over-saturated while grayscale uniformity is very good yielding a very smooth picture. We rarely see an LED back lit TV with such even back light uniformity – no clouding in blacks and no dark shadows in a mid-tone gray screen. Light flow-through is not as vibrant as some TVs. Peak brightness is only average. “Smooth” would be a good description of the colors and overall picture. This wide-gamut color technology has been fantastic for Sony for a couple years. It produces much more realism and true-to-life color renditions than most of Sony's competitors, and in general takes less calibration effort to obtain a watchable picture solution. We like the more realistic picture on the X850C. The colors are not over juiced as they are with some, but they still have plenty of pop and are beautiful. 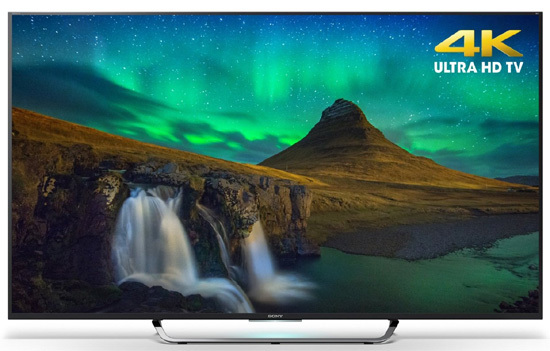 Up-scaling and conversion is the most important aspect of any 4K UHD TV for 2015/2016 due to the dearth of 4K content, and Sony excels most at it. As mentioned above, the picture is noticeably cleaner and clearer with up-scaled and converted HD programming than with last years X850B series. The new picture is astoundingly good at up-converting and smoothing the HD signal to the native resolution of the panel. If this were not the case, why buy a 4K TV in the first place except to future proof? Anyway, much of the upgrade this year is due to the new 4K Processor X1 engine incorporated into the X850C series. The benefits of 4K resolution will have to be seen by upscaling, and Sony is the best at it. 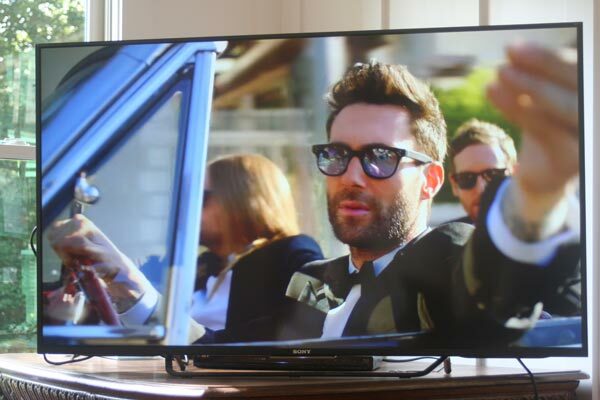 One of the best performances we've seen in this area for a mid-priced 4K TV. Although color saturation and contrast begin degrading at around 15 degrees, they do not degrade noticeably until around 30 degrees off center. The screen is semi-matte and does a good job of not reflecting in room light. I like this screen and TV better at night in a low light room due to it not having as much light-flow from the LED backlights (as some other brands). If you don't have any time to make adjustments, try the Cinema Pro setting for night­time viewing and the Cinema Home setting for day time viewing. Otherwise, use our Custom picture settings. Standard- Also over-hyped unnatural color, contrast preset to 100, too much blue in neutral color temp preset. Custom– This preferred mode gets you close to D65 and what we typically recommend for settings. Software related features under Clarity sub settings like: Reality Creation, Random noise reduction, and Digital noise reduction are all off under factory set. Under Motion the Film Mode (Cinemotion) is set to off. Cinema Pro– This is a very nice setting for a low light or dark room – especially for movies. Cinema Home- The increase in on-screen picture light is from the higher Gamma setting and moderately from the Live Color setting being in High. This is a good bright room and all purpose setting even for sports. Sports- We did not like this settings for sports nor anything else. It created lots of conflict and unwelcome additions on the screen, over-hyped color, motion artifacts, and even some strobing effects. The Film Mode is set to High so you get the soap opera effect unless you adjust it down. Animation– Did not test, but we can only assume animated movies look good on it. (For HDMI inputs there are also Photo-Vivid, Photo-Standard, Photo-Custom, Game, Graphics) Of course, the Game mode is the preferred setting for gaming to cut down on input lag. Sony flipped back to active 3D for the X850C series this year. Though we prefer passive, this is one of the only 4K TVs offered with 3D compatibility for the year. We took a view of How to Train Your Dragon from a PS3. While not the best 3D, the textures were detailed and picture crisp. There was some notable cross-talk. 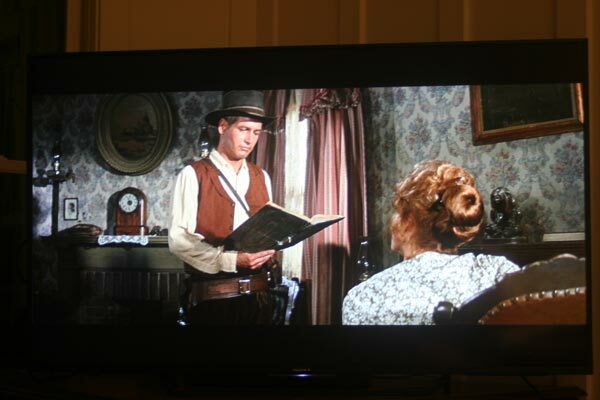 The TV does not come with any 3D glasses in the box. The compatible glasses that we found TDG-BT500A or 400A are around $70 per pair – an unwelcome surprise. The XBR-75X850C lacks the side mounted speakers we've seen in the XBR series before. "Sony does not seem smitten by the curved screen craze from Samsung and LG." Sony does not seem smitten by the curved screen craze from Samsung. I agree with them. What's the point? Sony's design elements are simple and straightforward with the 2015/2016 selections with a very thin quarter inch frame and 2” or so depth on the X850C series. It's basically the same matte black finish frame that looked good last year. The simplistic center mounted stand keeps the TV looking sleek. Overall it's an almost frame-less, and very unobtrusive design allowing the picture to stand out. 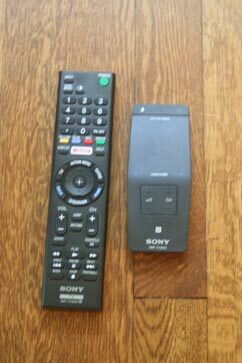 The new jet black matte finish touch pad remote from Sony has a very nice fast responsive touch pad that definitely speeds across Smart TV Apps and also speeds up search considerably when typing on the on-screen keypad. It's a swipe and click pad, not as good as the point and click remotes but an upgrade over a 5-way controller. The word recognition in the voice search function is extremely impressive. Even searching for peoples names in the You Tube App, the Android search picked up immediately. The voice search function is mostly useful for You Tube, and Google Play searches. The voice recognition search works even in a noisy room. The TVs response time on delivering results is fast and accurate. The X850C also comes with a second standard remote control (RMT-TX100U). 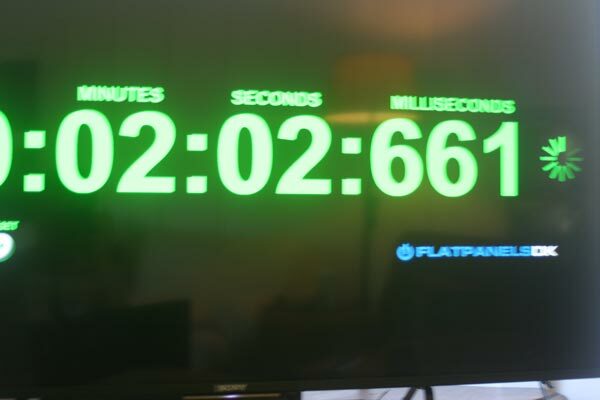 Input lag measured out at 35ms – a very good result while in Game mode. This would have been about our best times last year, but a few competitors are faster this year. 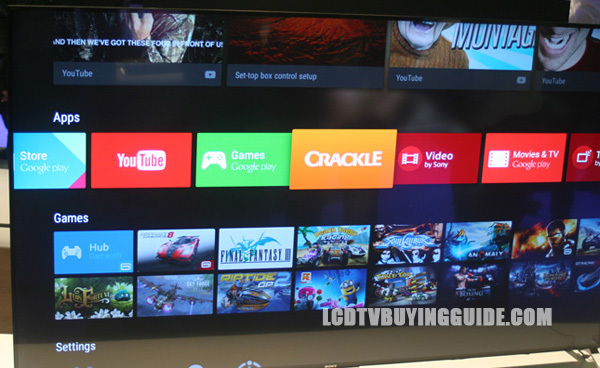 Android TV featured Apps include Netflix, Hulu, Amazon Instant, Vudu, Pandora, iHeartRadio, Crackle and SiriusXM, and around 30 small insignificant Apps. There are 9 highlighted Google Play games (but you have access to tons). At first it looks like a limited selection until you delve into the Google Play Music, Games, Movies and TV options. Then lots more content opens up. What we really like is the operation speed combined with excellent video and sound quality of the Android/Google Play section of the Smart TV offerings. This is a differentiator from the competition. The voice search function on the touchpad remote works exceptionally well and fast with You Tube and Google Play options. Google Cast allows you to show movies, pictures, and TV shows from your IOS or Android based smartphone or from a laptop. The TV menu interface is clean looking (albeit confusing) and there are tons of preset picture options (7 not counting photo.) The Cinema Pro and Cinema Home settings are good right out of the box. But operation of the menu system is quirky and difficult and there are some mis-titled settings such as Brightness rather than Backlight. The processor also had a tough time handling commands given too quickly. 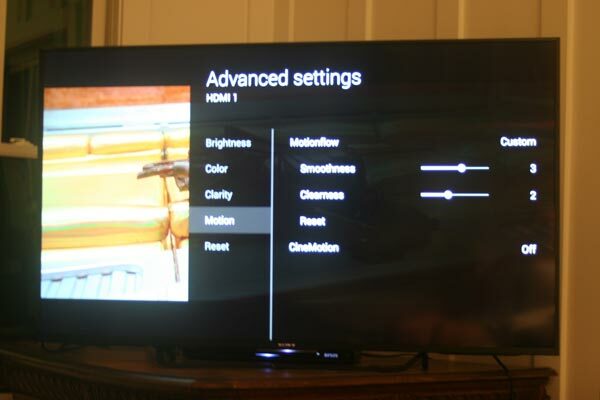 The Smart TV layout is easily accessed by the Home button on the remote. This brings up all the Smart TV Apps and Google Play options. The Film or Cinemotion (depending on software update) Picture Setting is located in the Picture Setting Adjustments menu, under Advanced Settings, under Clarity. The setting combined with the Motionflow setting has an impact on whether your picture is over-clarified by eliminating too much natural background blur. This creates the dreaded “Soap Opera Effect”. It's easy to prevent on the X850C. All you have to do is keep the Motionflow Smoothness setting at level 3 and Clearness setting at level 2 and tune the Film/Cinemotion setting to Off or Low. The feature only provides frame compensation to remove judder at the top two settings of Medium and High. All of that said, The Soap Opera Effect is not nearly as pronounced and distracting in the X850C as with many TVs on the market such as the Samsung's. The X850C comes preset with the ClearAudio+ feature set to on. There are too many unwanted side effects from this sound setting including a hollow echoing effect. We recommend immediately turning this feature Off. This is all we needed to adjust to get a very good respectable sound quality from the TV. Voices were clearly separated from background noise and music. Both were nicely defined for a very good sound quality. Volume capability is adequate but not the best tested. It took a 50% volume setting to fill a large room. It takes 5 or 10 minutes to get connected the first time, but the connection capabilities are good. We were at least 40 feet from the router and received fast responses once we connected a couple times. It's a little glitchy upon setup, so be patient. The next day things should be seemless. You will likely need to update the software after connecting. We recommend doing this right away. Below are the Google and software versions we were connected with. HEVC and VP9 codecs are necessary to decode some current and future 4K video sources from Netflix, Amazon, You Tube and others. For the X850C all 4 HDMI inputs are 2.0 and HDCP 2.2 and one is MHL compatible (HDMI input 2). The X850C is DirecTV Ready. It has both HEVC and VP9 compatible decoders. Sony also has a 4K media player with the currently largest selection of 4K content (sold separately and dearly). The XBR75850C is an excellent value for a 4K TV at $4497. With the X850C 4K upscaling and conversion stands out among competitors. Sony's color rendition is also a reason to buy this model. Google cast and Android TV are very useful and easy to navigate Smart TV platform with ample offerings. This is a huge improvement over previous Sony Smart TV platforms. The prime competitor for this model is the Samsung UN75JU7100 which sells for about $500 more but notably lacks 3D.